The Downtown Dunedin Merchants Association (DDMA) hosted a city commission candidate forum at the Bon Appétit restaurant on Wednesday evening. All six candidates attended. The candidates present were: mayor Julie Bujalski and her opponent commissioner Bruce Livingston vying for mayor, also Moe Freaney and Mike Jones vying for seat 1, and Heather Gracy (incumbent) and Reuben Hepburn vying for seat 3. Click on their names to see their respective campaign websites. Audio of most of the candidate forum (67 minutes worth) is available here on Youtube. Superficially, it may appear that the candidates spoke to issues, but none of them mentioned sewers or the recent sewer overflows, as just one example. In all their talk about “visioning” and what they want their “village” to look like, they seemed to forget that neither the Bauhaus architecture nor the Art Deco movement were invented by government. Reuben Hepburn (pictured right) chose to go out from behind the candidate tables to deliver his message. At one point, Heather Gracy had the opportunity to address the audience right after Hepburn. 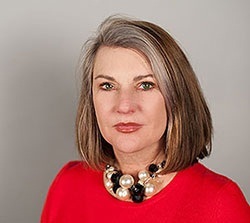 Gracy then said (<== click link for audio) that she would stay at the candidate’s table because “there’s a lot of cords, and I have high heels, and I’m just not into a lot of acting and theatrics”. 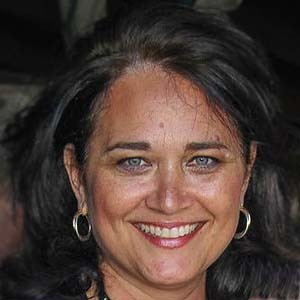 Gracy’s comment was a thin-skinned reference to her opponent’s unique and engaging style. 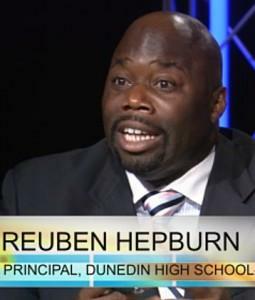 Hepburn is the former principal of Dunedin High School, and thus quite well-known. When first introduced to polite applause, Gracy (pictured left) said “thank you for that round of applause, I’m going to ask for one more.” Gracy proceeded to say (<== click link for audio) “I make a lot of decisions for you all on a daily basis, but the best one I make every single day is to wake up next to that guy back there named Andrew and to love him every single day”. Gracy was referring to her husband. Applause predictably ensued, but Gracy did not elaborate on why she has to decide “every single day” whether she wants to wake up next to her husband. When in the limelight, Gracy’s bachelor’s degree in English and Mass Communications was of no help to her as she bungled a cheap applause line and highlighted the importance of proper diction. “Dunedin Diction” could become a punchline if Gracy keeps it up. When asked “what does the candidate see as the role of the city in the production of major events, given the positive economic impact these events have on the city”, Bruce Livingston, Mike Jones and Reuben Hepburn all said “it’s a tricky situation”. However, no candidate questioned the economic impact that was the premise of the question, or whether spending money on events is tax dollars well spent. Very soon, the city is likely to spend approximately $100 million of tax dollars on retaining the Blue Jays in town. Hepburn said that “making sure they stay right here in Dunedin” is a “priority”. Also in this case, no candidate questioned whether tax dollars should be spent on the Blue Jays. The reported attendance at Dunedin Blue Jays games is less than 800 people per game, and actual attendance is lower. The Dunedin Blue Jays play in the Florida State League (FSL), a single-A league. Ken Carson, President of the FSL, told the Guardian via e-mail that the attendance they report is “sold plus comp [=free] tickets”. In other words: the actual attendance, and thus economic impact, is actually much less than some may think. The spring training Toronto Blue Jays have averaged approximately 70,000 people per season for the last three years (third worst in the Grapefruit League), and that is based on the dubious “announced attendance” metric that that Major League Baseball uses. Announced attendance is the number of tickets sold, not the number of people through the turnstiles. Florida Auto Exchange stadium is already almost filled to capacity during the 15-game spring training season. The maximum a spring training season can draw is 83,000 people with the current size of the stadium. Mayor Julie Bujalski said in 2015 that the Blue Jays “are truly a community partner and our relationship with them is extremely important to Dunedin”. The Guardian sent questions to Bujalski asking about the Blue Jays on September 11. During the forum, in response to a question from the Guardian reporter, Bujalski said “I will not answer any questions by [sic] the Tampa Bay Guardian. I did not receive your Blue Jays e-mail”. If Bujalski doesn’t intend to answer questions, then it’s irrelevant whether she received the e-mail with the questions. Bujalski has previously confirmed receiving questions from the Guardian about her status as a preferred boat slip renter in the city marina, but also in that case, Bujalski provided no answers. After the forum was over, we asked Bujalski why she wouldn’t answer questions from us, but she walked off in silence. Bujalski also repeatedly refused to answer questions about an alleged incident involving her in the Toronto Blue Jays owner’s box during an official public relations trip to Toronto in late July. Bujalski’s opponent in the mayoral race, Bruce Livingston (pictured right), also didn’t want to answer any questions from the Guardian. When asked why, Mr. Livingston said “I just think this is a very sensitive forum”. This answer seemed odd, given that a candidate forum would be a good place to ask questions of candidates. All city commissioners were at the forum. We spoke to all, but only John Tornga said he was willing to look into the issues raised with Bujalski’s boat slip rental. Tornga also said he would look into the alleged incident in Toronto. The latter is a relevant matter, because if true and not disclosed, it could weaken the city’s negotiating position with the Blue Jays. There was a question and ensuing discussion about how much public input to take at public meetings. 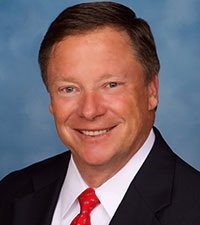 When decisions are made at public meetings, the commission has no choice because Florida Statutes 286.0114 requires that the public “be heard on a proposition before a board or commission”. None of the candidates mentioned this requirement in their statements. Commissioner Deborah Kynes (pictured right) was at the forum as an attendee. Kynes did not want to comment on the mayor’s boat slip arrangements with the city, saying “I will always talk to my own ethics. If you have anything you wish to discuss with me about my ethics, you got me. But I won’t talk about other commissioners”. All Florida elected official take an oath of office that requires them to “support, protect, and defend” the Florida Constitution. Section 8 of the Florida Constitution covers ethics. Kynes’ repeated solipsistic statements during our 5 minute interview suggest that she thinks that her promise to “support, protect and defend” is kept if she simply herself adheres to the Florida Constitution. The Guardian submitted a written question for the forum, but due to a series of errors, the moderator never asked it. The question involved the $10,000 per year that they city gives to the Chamber of Commerce (a private corporation). We say “gives” because no contract exists between the parties, and there was no bid process for the services that Chamber President Lynn Wargo said the chamber provides in return. However, this article is about the candidate forum, so the city’s cozy relationship with the chamber will have to be the subject of a future article.